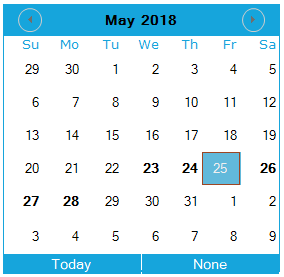 How to customize the MonthCalendarAdv dates as Bolded dates? User can customize the font style of specific dates as Bold. It can be achieved by handling DateQueryCellInfo event. Here we have added the required bolded dates in BoldDateTime list, then check its value with MonthCalenderAdv date cell value in DateQueryCellInfo event. If date value matched, font style of corresponding date changed to bold. The following code demonstrates the same.